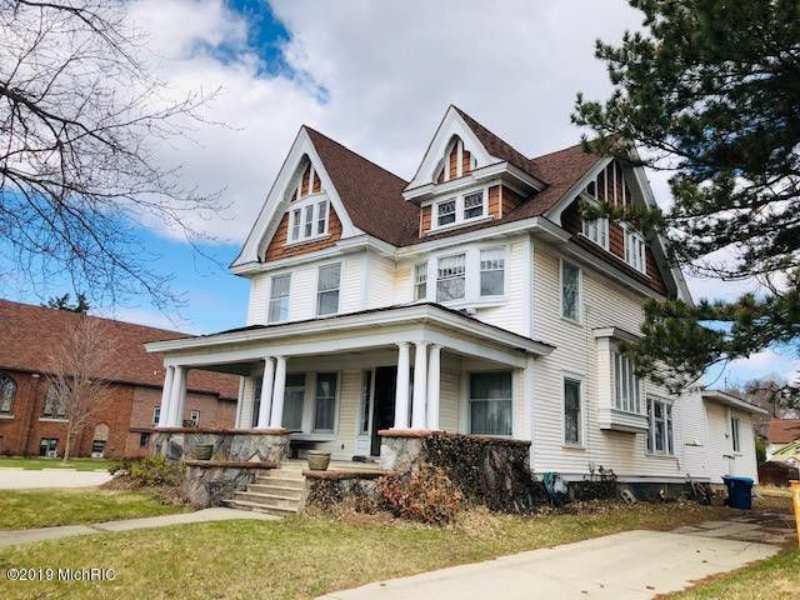 Really nice house! 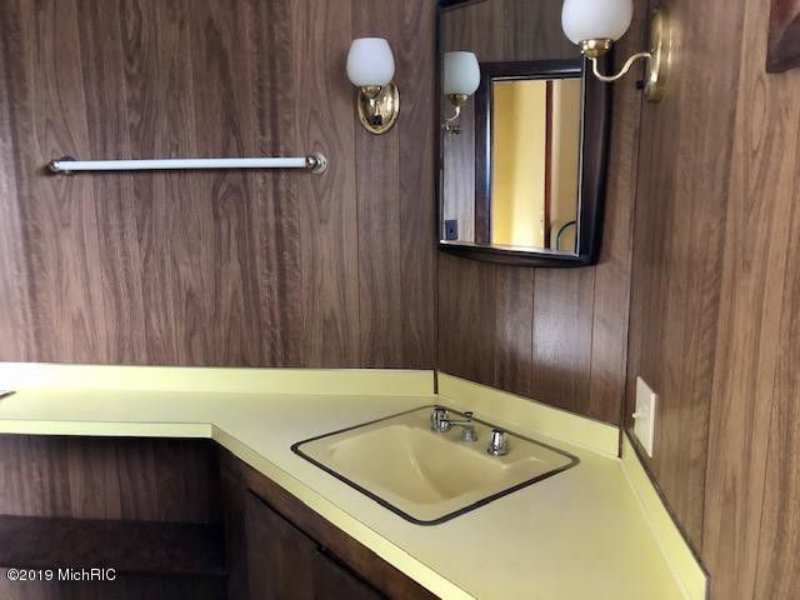 I love the colored bathroom fixtures, too! 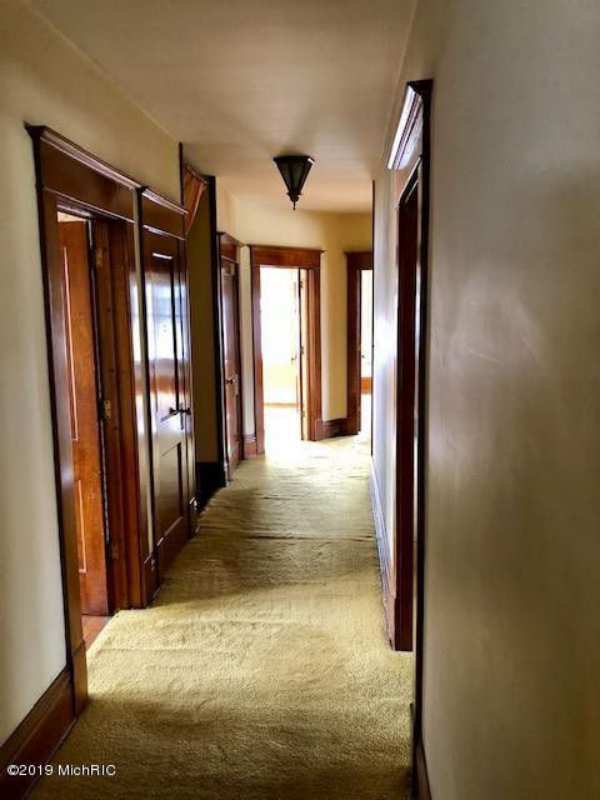 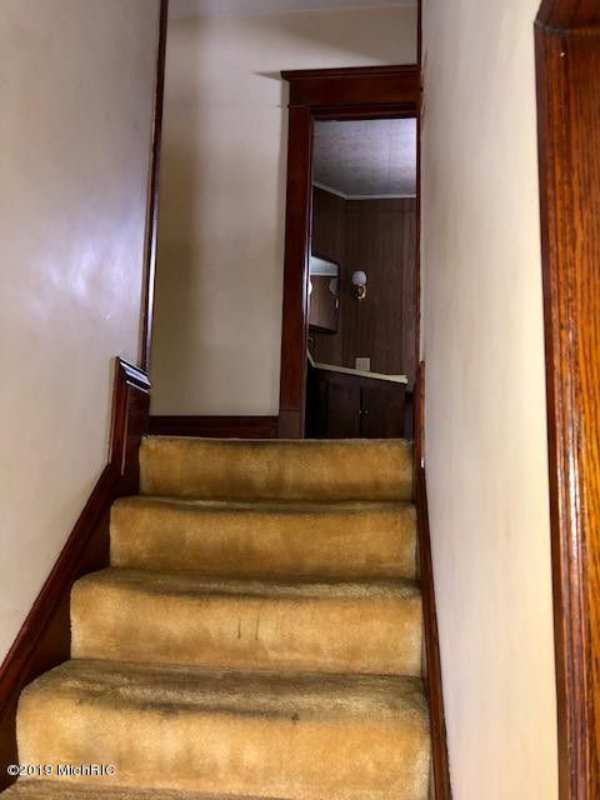 It’s funny sometimes, the memories looking at old houses evoke. 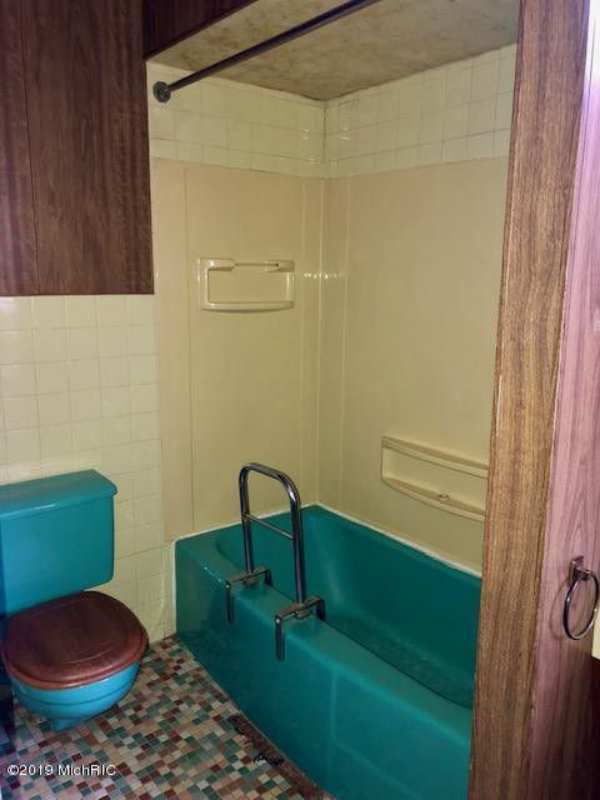 The turqouise bath fixtures are very nearly the color of our dining room walls when I was a kid. 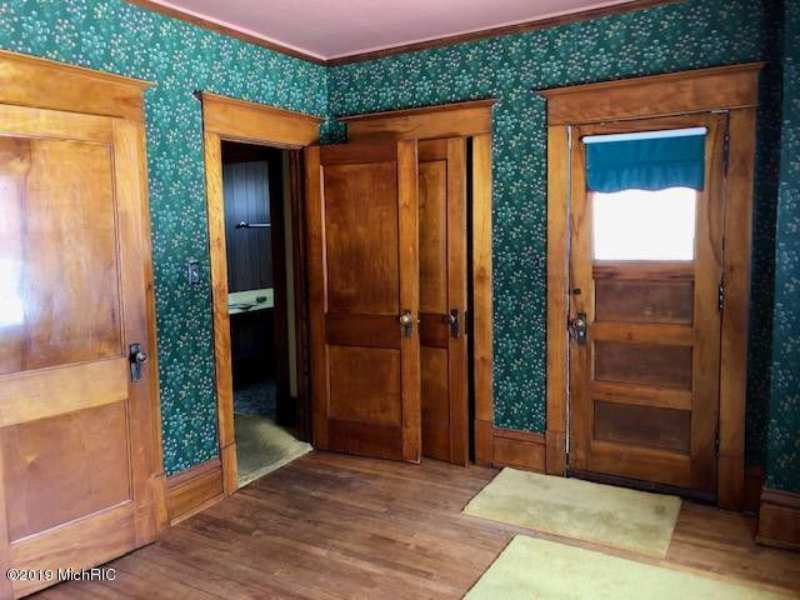 It was the first (and only) new house my parents ever owned, and my mom and her father painted the inside. 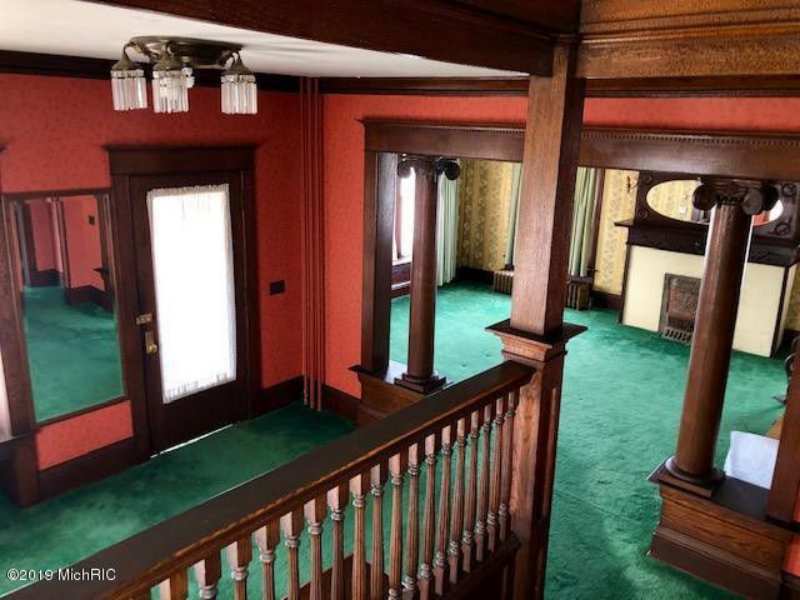 The light fixtures and woodwork are GORGEOUS! 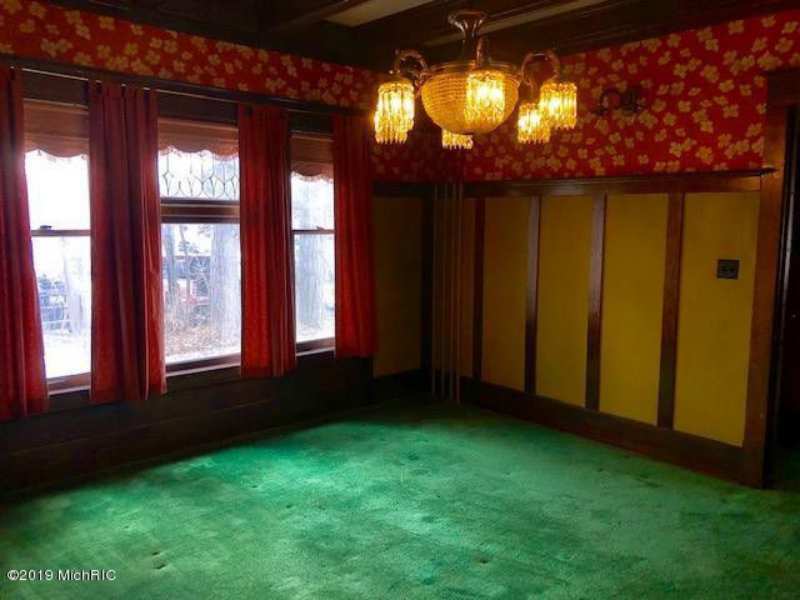 It seems like you could take up the dark carpet and put a light color on the walls and it would brighten the whole place. 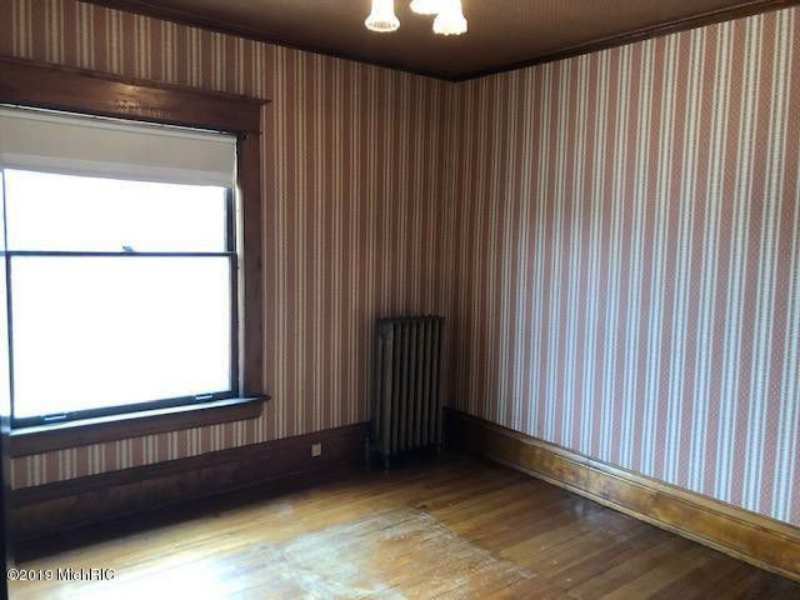 Wallpaper and carpets are, ah, not what I would have chosen. 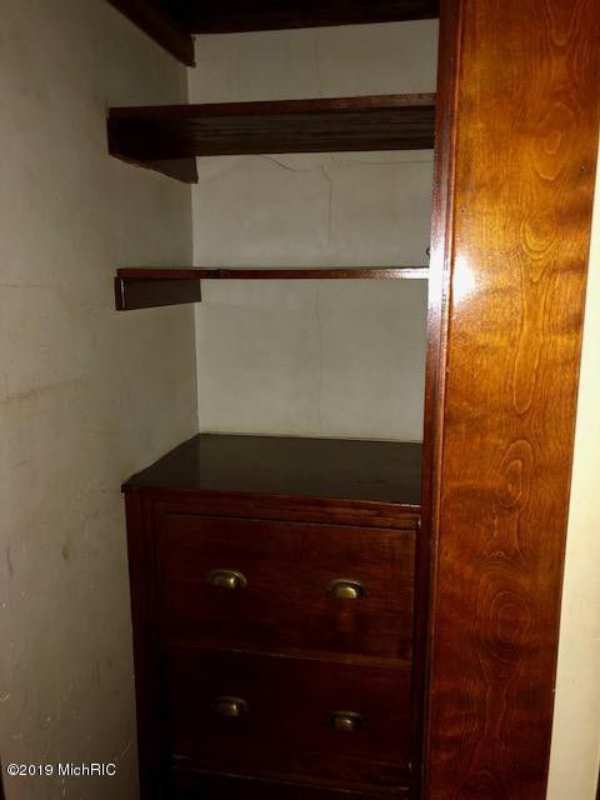 But, everything else is virtually untouched. 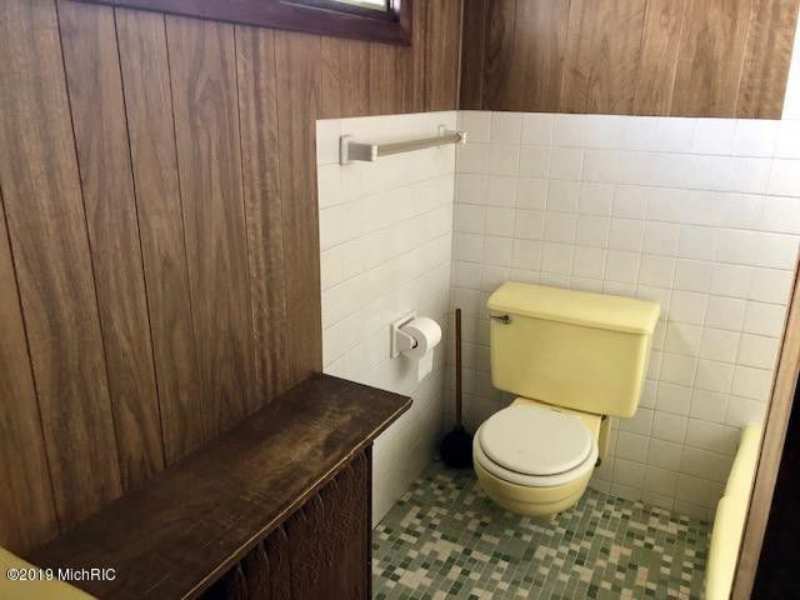 I’d tidy up the bathrooms, make them a bit more co-ordinated. 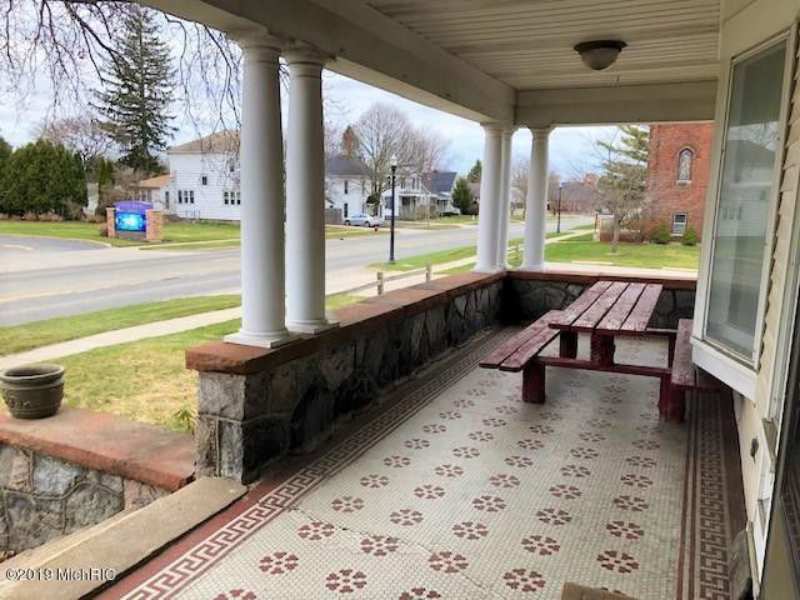 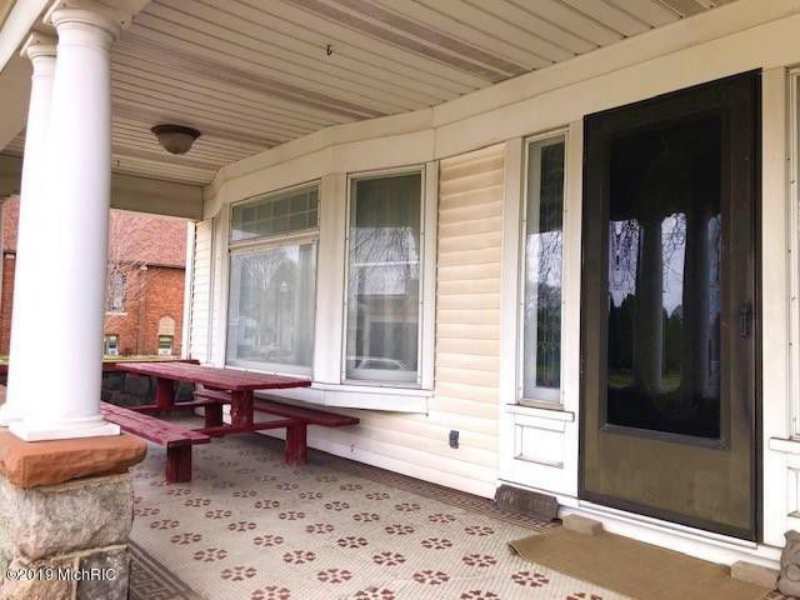 The tiled porch is really nice. 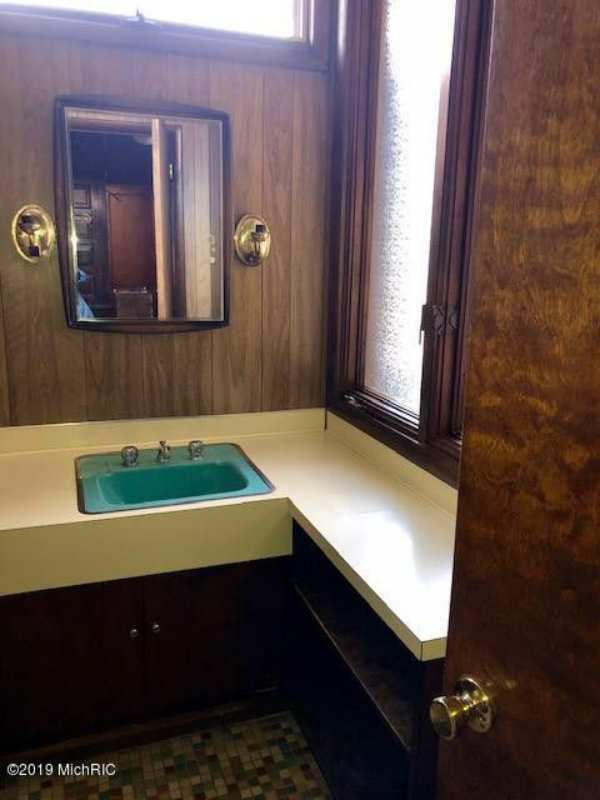 All the light fixtures are nice (as far as my knowledge goes). 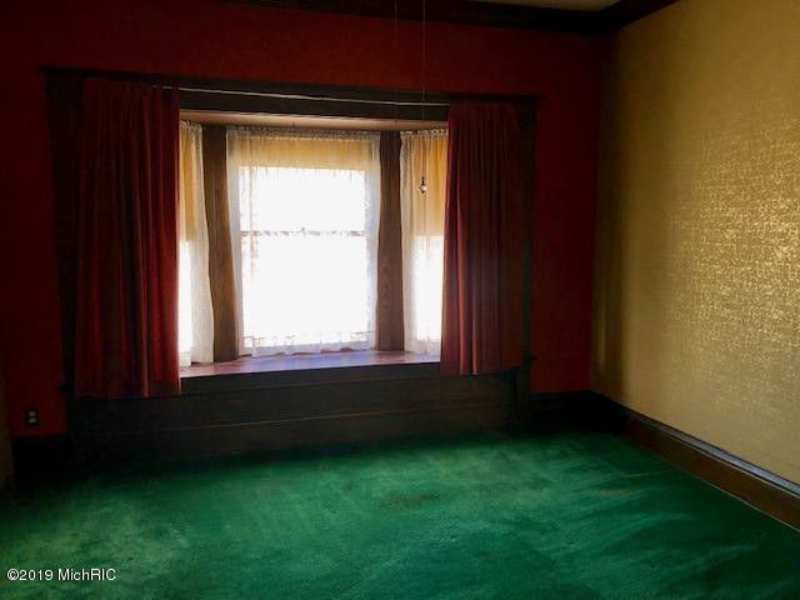 Unfortunately, it’s not a great location, at least for me. 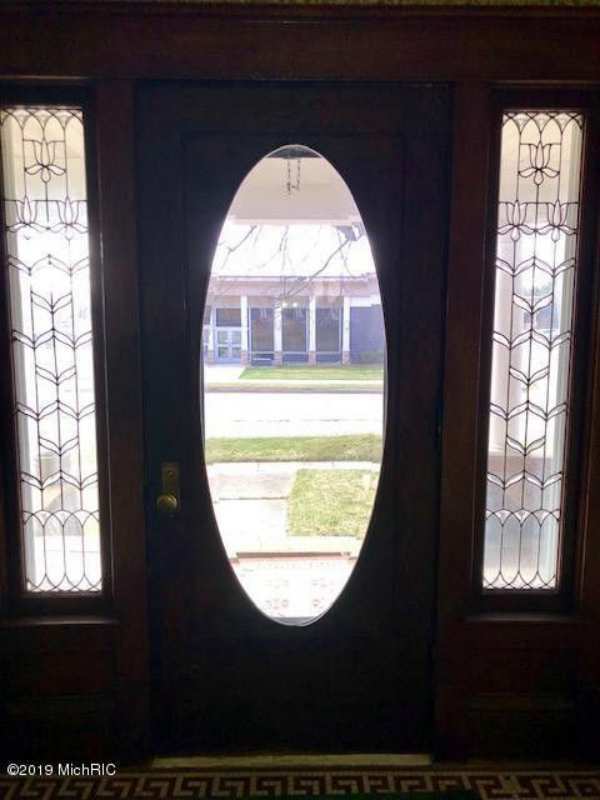 But it keeps the price low, and your street would always be plowed! 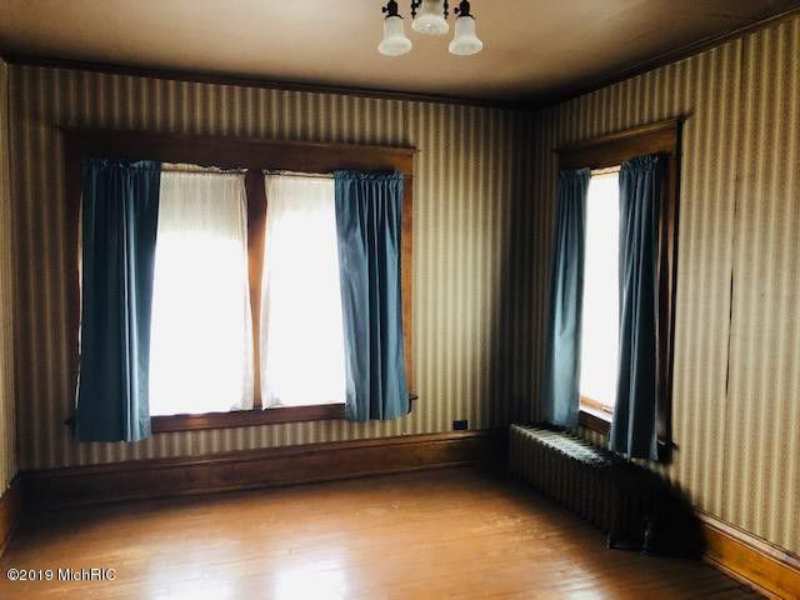 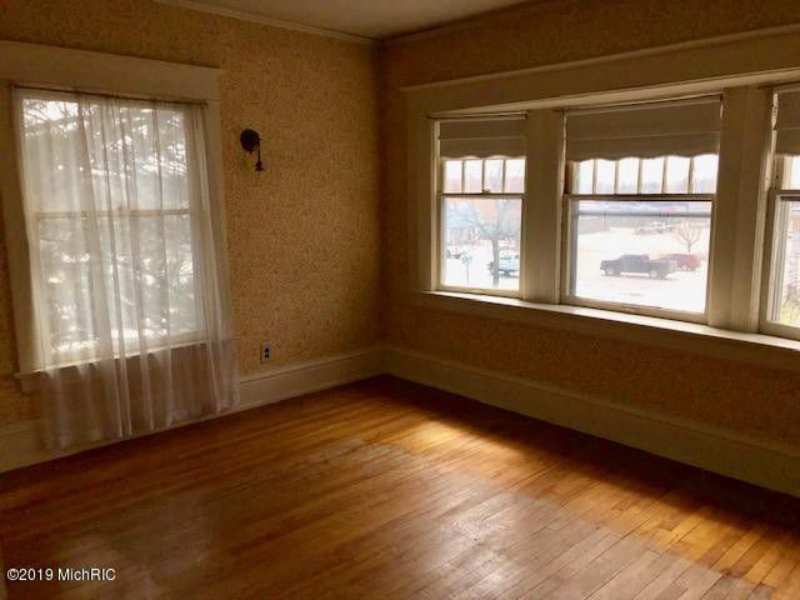 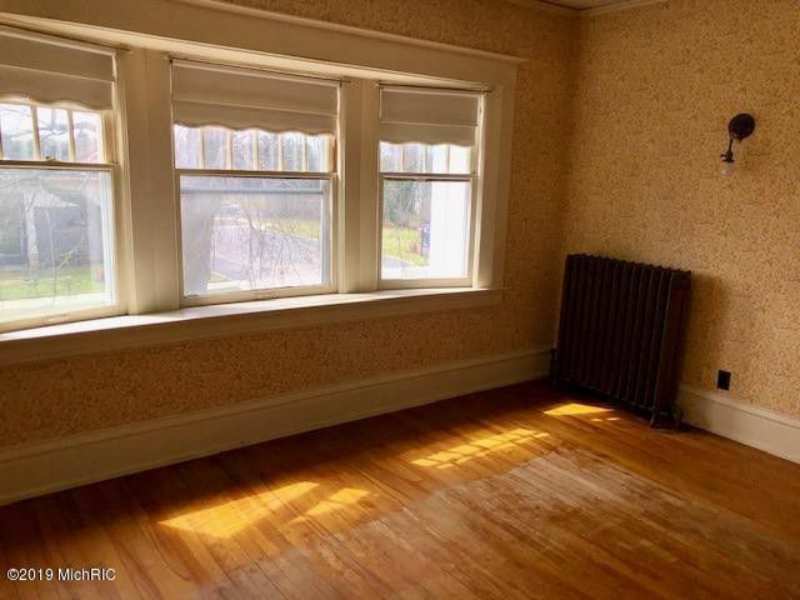 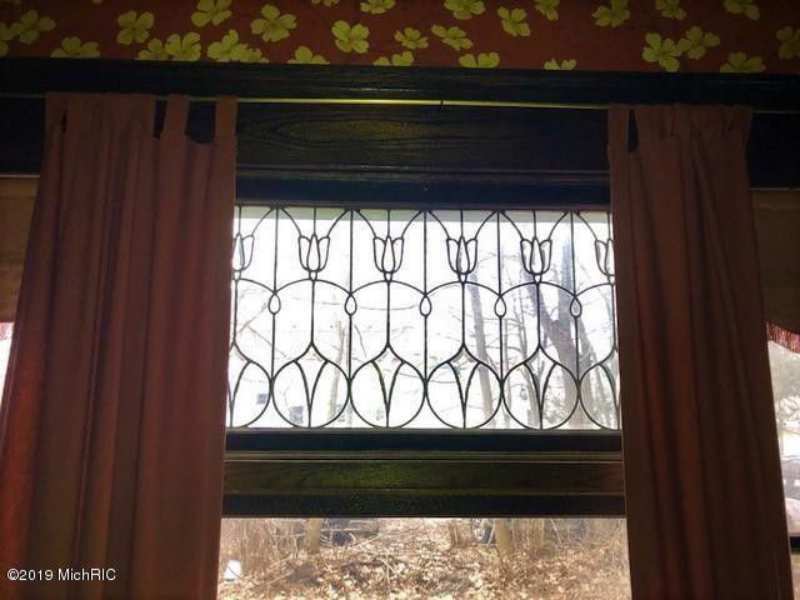 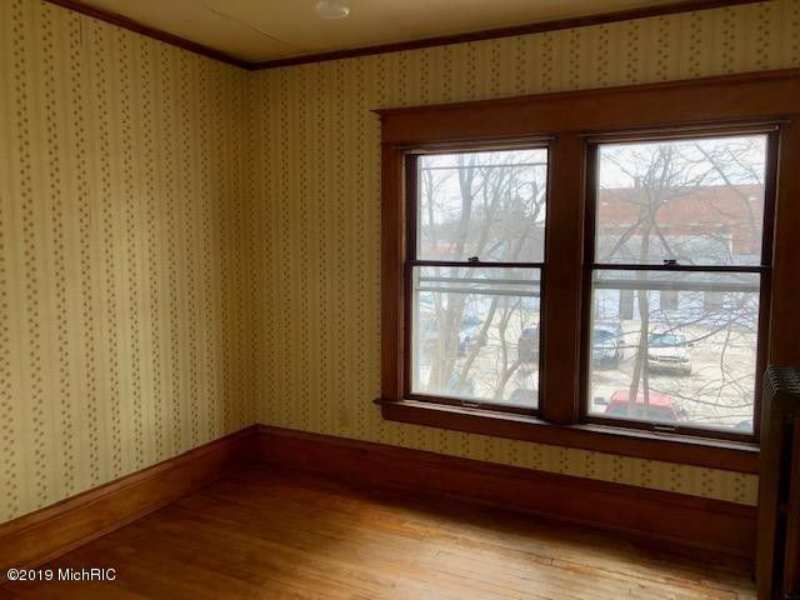 This house has a ton of potential. 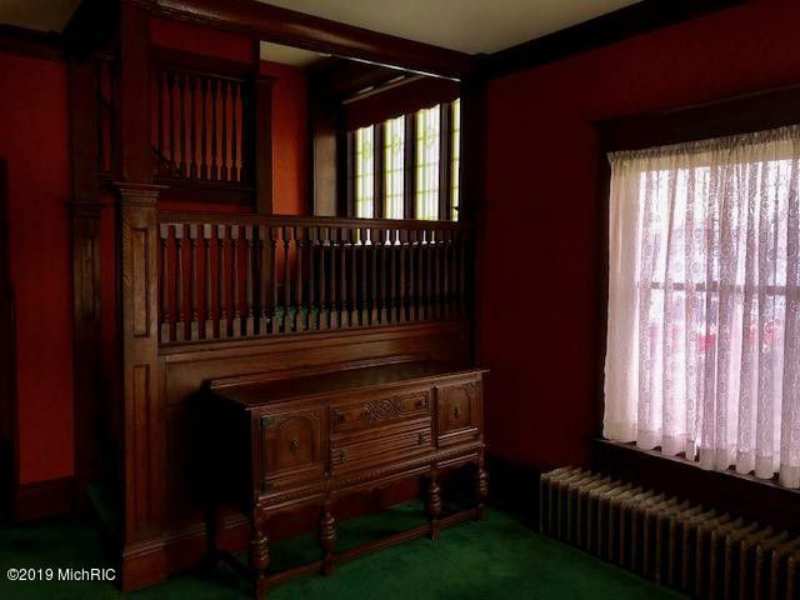 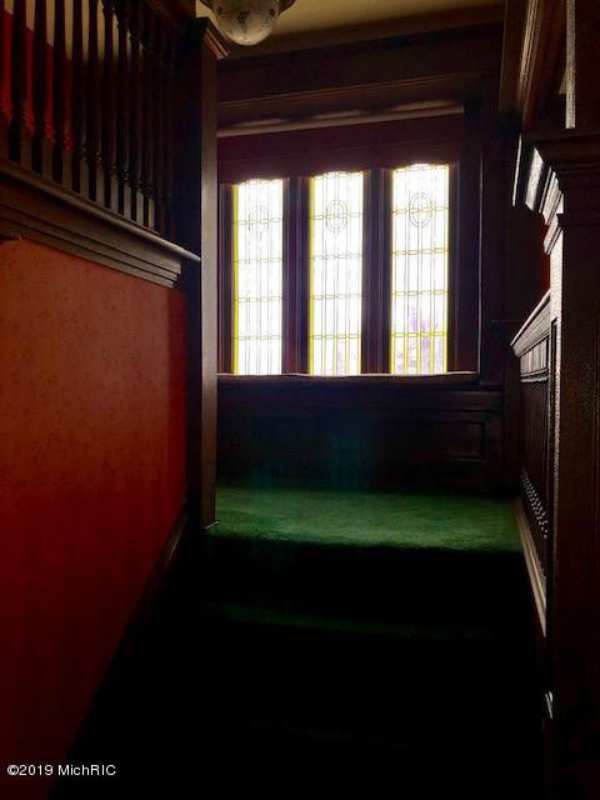 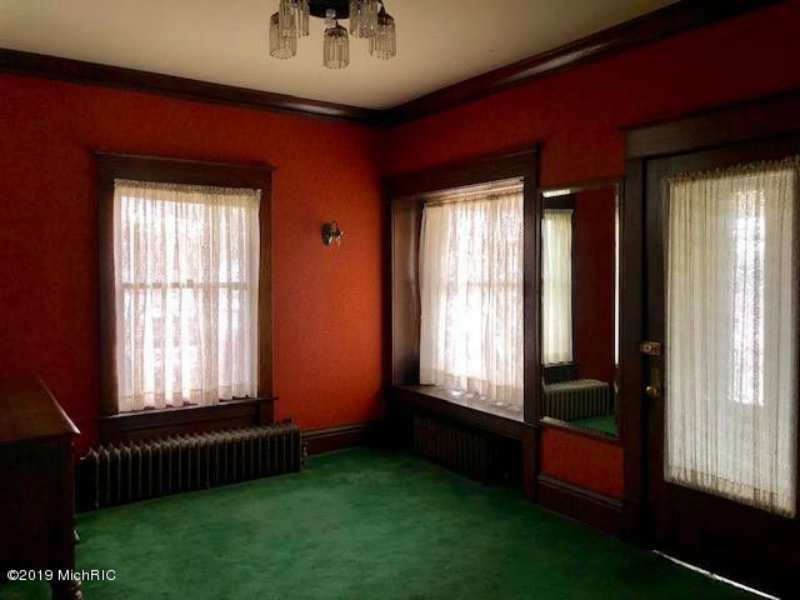 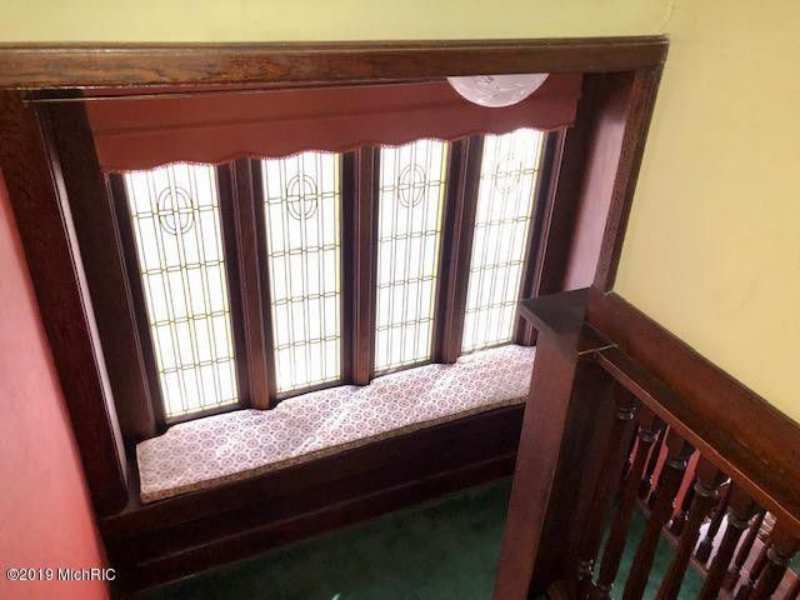 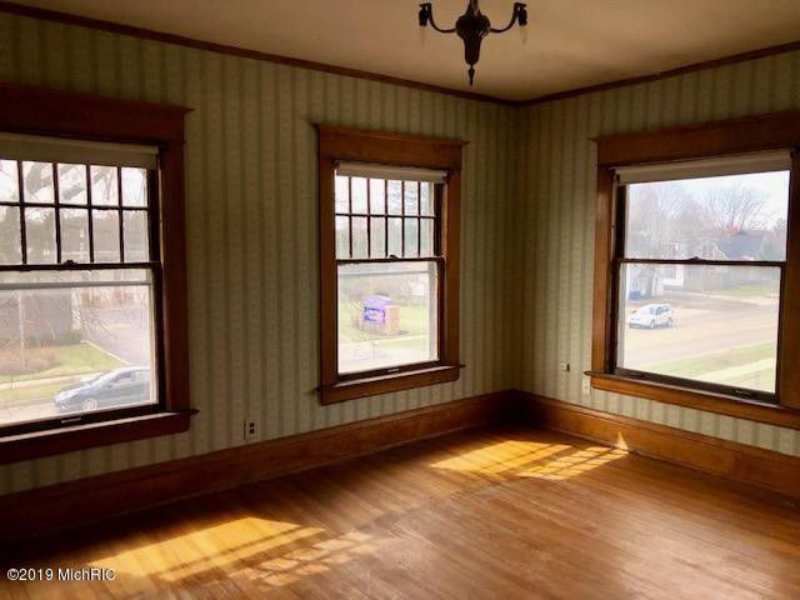 Beautiful woodwork, probably more hardwood under that carpet, and the window on the stair well. 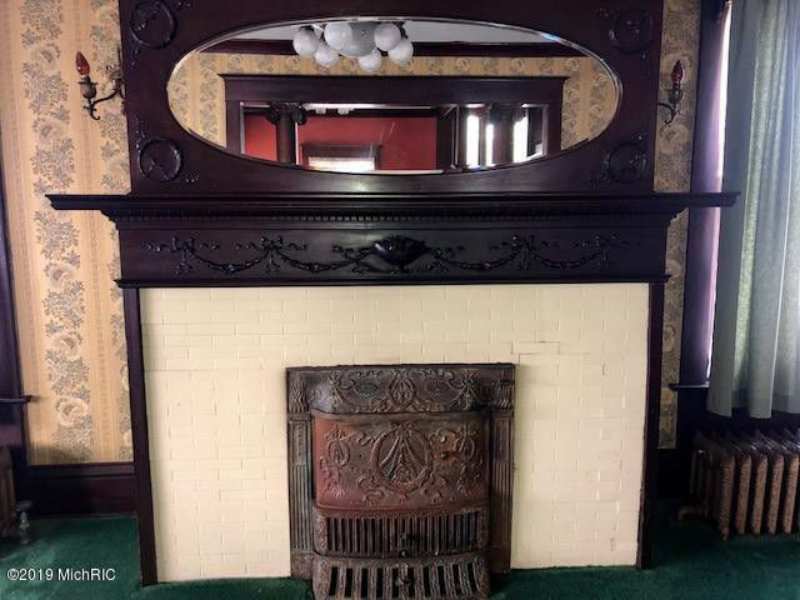 *sigh* Some elbow grease and not all that much $$ and I think you’d end up with a very nice home. 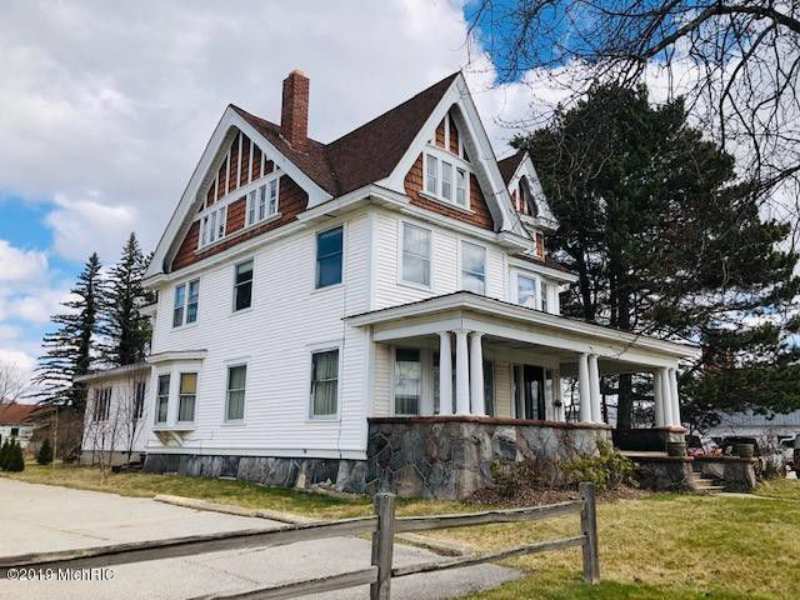 This is a perfect Edwardian era home. 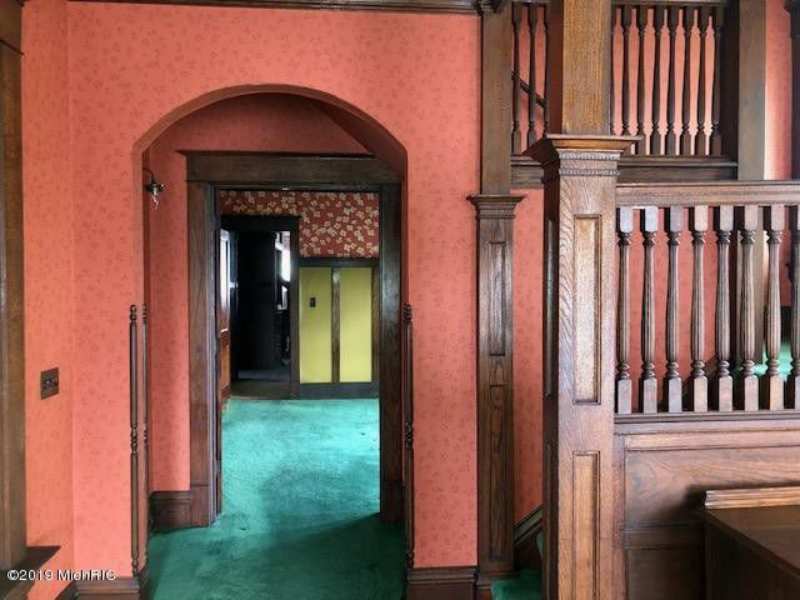 The style is transitional between Victorian and Modern with mostly Colonial details, and touches of Craftsman and Art Nouveau. 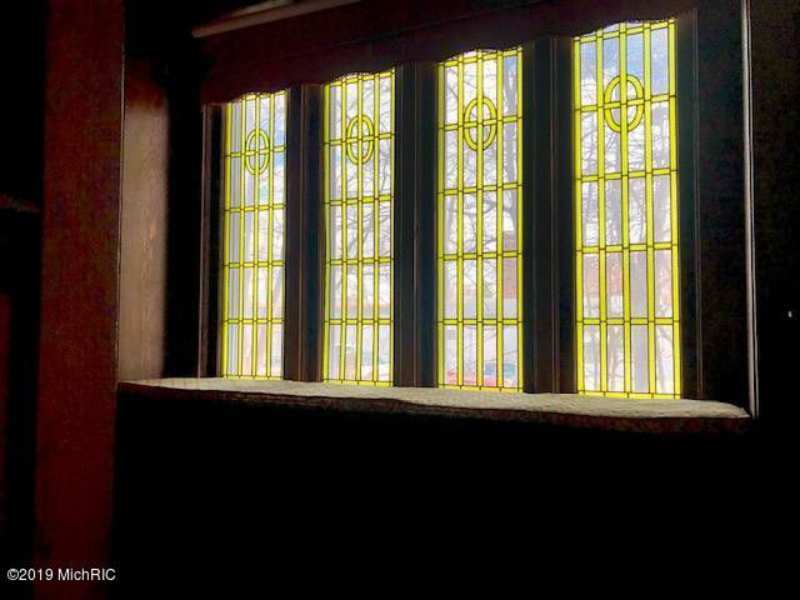 Some lovely millwork and glass! 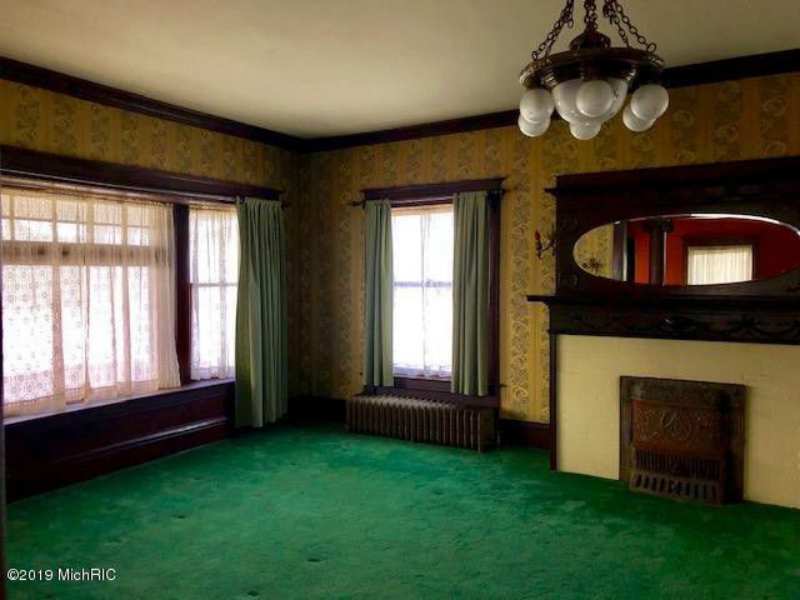 Just needs some decor and bathroom adjustments; there’s probably a kitchen in there too.